In 2008, Aarhus University hosted a seminar on “The Afterlife of Roman Sculpture: Late Antique Perceptions and Practices” that aimed to look at the variety of late antique perceptions of statuary, focusing on a few select regional case studies – from Alexandria in the east to Britain in the north – , and such diverse phenomena as collecting, deposition and destruction. This follow-up seminar is envisaged as providing an opportunity for both senior and junior scholars to arrive at a broader understanding of the fate of Graeco-Roman statuary during the period between the fourth and the seventh centuries AD. It is hoped that by integrating both textual and archaeological approaches, as well as empirical and theoretical methodologies, it is possible to provide a rich and multifaceted picture of the changes in the sculptural landscape of the Classical world. The seminar will consist of three keynote papers by Prof. John Pollini (USC, Los Angeles), Prof. Franz Alto Bauer (LMU, Munich) and Prof. Ortwin Dally (DAI, Berlin), and five 30-minute papers. Abstracts for papers and short CVs are therefore invited for submission by 8 September 2010. Accepted speakers will be provided with full funding including travel costs and accommodation at Aarhus, thanks to the generous support of the Danish Research Council. 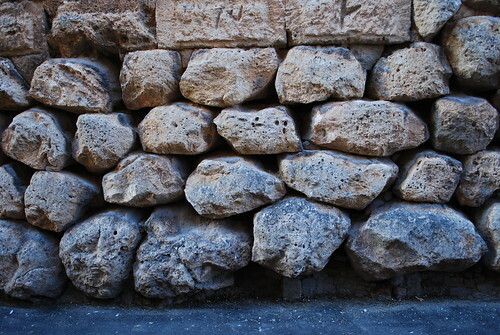 City walls of Tarragona. Photo: TMK, December 2009. 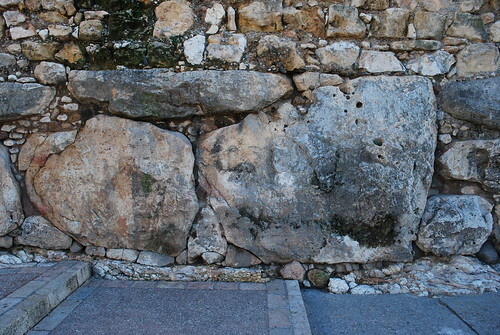 Some shots of the city walls of Tarragona, including some of the “cyclopean” bits. More below the fold. 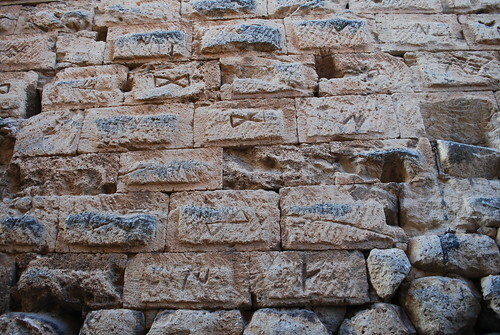 City walls of Tarragona: Masons’ marks. Photo: TMK, December 2009. 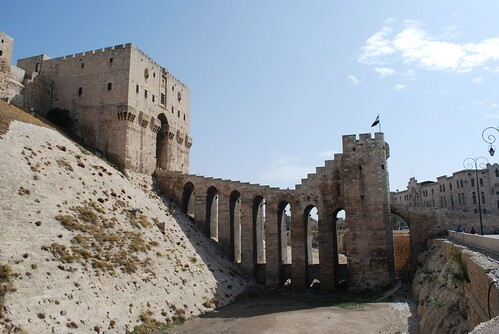 Main gate of the Aleppo citadel. Photo: TMK, October 2008. Here’s a good little free guide to the Aleppo citadel, courtesy of the Aga Khan Trust (via AWOL). It has excellent illustrations to help visitors make sense of the multi-period monuments on the citadel. The Aga Khan Trust has similar guides to the Castle of Salah ah-Din and Masyaf Citadel where they also have been responsible for conservation works and site management. 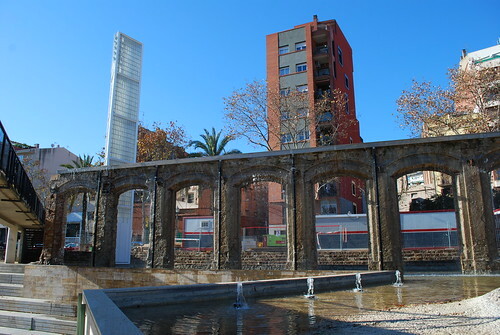 Factory facade reused as waterfall in Parc del Clot, Barcelona. Photo: TMK, December 2009. My old blog (in Danish) frequently featured posts on urbanity, ruins and urban exploration, topics that I have only rarely touched on here. 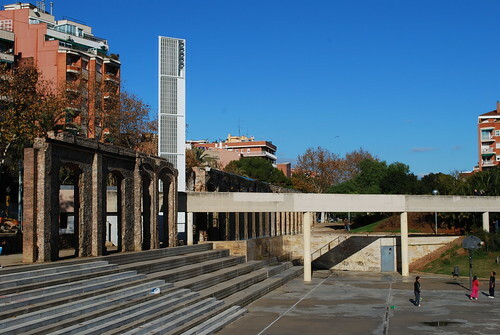 Yet during a recent visit to Barcelona, I was struck by notable attempts to incorporate the industrial heritage of the city into the urban fabric, especially in the case of Parc del Clot (further discussion here), opened in 1986. Elements of the factory that once stood on its grounds have been re-used in a number of creative ways. Part of the old facade has become a waterfall, a chimney stands majestically as a landmark in the park, etc. More photos below the fold. Parc del Clot, Barcelona. Photo: TMK, December 2009. I seem to have slept on this, but the Danish Research Council has for at least a year now promoted open access to academic journals. As stated in their current guidelines, all journals that receive funding from the council must be made available freely online within one year of initial publication. This is good news and a step in the right direction. Elektroniske tidsskrifter skal være gratis og frit tilgængelige på internettet. Papirtidsskrifter skal have en hjemmeside, hvorfra artiklerne er gratis og frit tilgængelige i elektronisk form senest et år efter udgivelsen af en årgang. I en overgangsperiode vil FKK kunne dispensere fra dette krav, såfremt der i ansøgningen angives en konkret plan for, hvornår tidsskriftet vil kunne opfylde kravet. Dette skal senest være opfyldt, inden bevillingsperioden udløber. Der vil ligeledes i en overgangsperiode kunne søges om ekstraordinære tilskud til at oprette en digital platform. Endelig kan der søges om særskilt støtte til retrodigitalisering af ældre numre, gerne i et samarbejde mellem tidsskrifter. I ansøgningen angives en konkret plan for oprettelse af digital platform og for retrodigitalisering. In related news, AJA has just announced that all their book reviews from now on will be online only as well as freely accessible. Will this become a trend that more journals will follow? 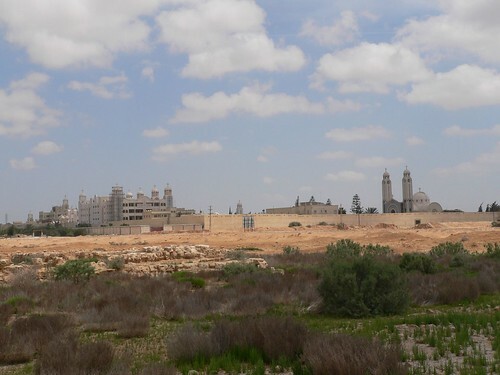 The new monastic complex at Abu Mina, as seen from the ruined Northern Basilica. Photo: TMK, May 2008. In a post last month, I mentioned my emerging interest in pilgrimage, especially from as seen from the perspective of material and visual culture. This interest stems, at least in part, from visits to sites that are still frequented by worshippers. The Coptic monastery at Abu Mina, 45 km southwest of Alexandria, is one such site. Many visitors on the way to the archaeological site of Abu Mina, one of the most spectacular early Christian sites in the Mediterranean, stop by the modern monastery (the monastery’s official website is in Arabic only). 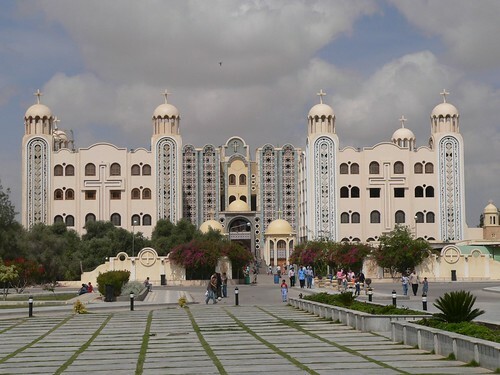 Architecturally it may not live up to everyone’s expectations of an “authentic” Coptic monastery, but the life that its clergy and patrons bring more than makes up for it. 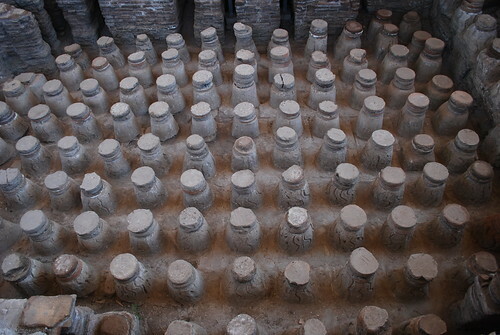 Their activities can be only be imagined when visiting the archaeological site. 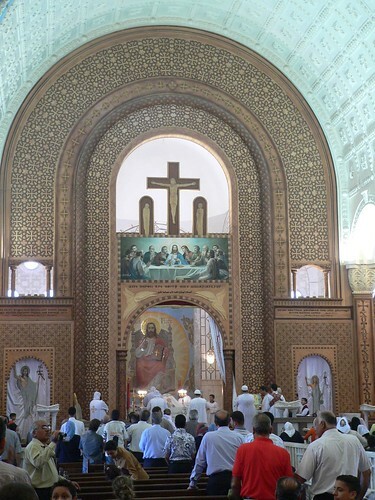 Interior shot of the new Cathedral of St Menas that holds his relics. Photo: TMK, May 2008. The new monastery has many of the facilities that the ancient pilgrimage site would have had. It has several very large dining halls and dormitoria for visitors. The “secondary” activities that we imagine taking place in sanctuaries, such as trade and industry, can also be observed. During my visit, I was, for example, very surprised to find that the monks now market their own series of household products! The “old” visitors’ rest house at the “new” Abu Mina monastic complex. Photo: TMK, May 2008. 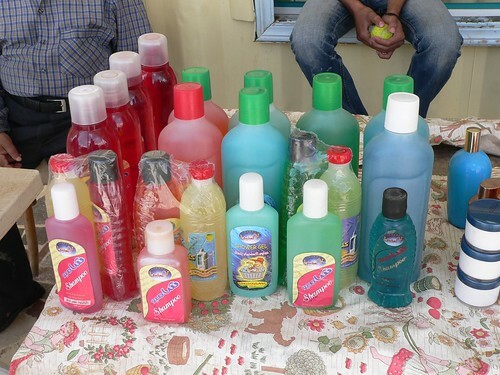 Abu Mina household products on sale. Note the logo with the camel! Photo: TMK, May 2008. 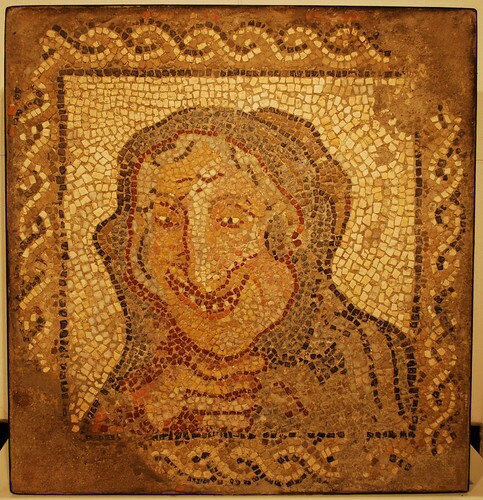 Mosaic depicting an old woman in the Barcelona Archaeological Museum. Photo: TMK, December 2009. Here’s wishing all the best for the New Year to all readers out there! Next week, I’m off to Rome for our “Using Images in Late Antiquity” conference at the Danish Academy. It should be very interesting and I also hope to catch a few exhibitions while in Rome. Both programme and abstracts for the conference are available from the link. - Successfully defending my PhD dissertation “Archaeology of Response. Early Christian Destruction, Mutilation and Transformation of Pagan Sculpture in Late Antiquity” on 16 December. - Seeing the publication of two articles: “Embodied Images: Christian Response and Destruction in Late Antique Egypt” in Journal of Late Antiquity, and “Religious Conflict in Late Antique Alexandria: Christian Responses to ‘Pagan’ Statues in the Fourth and Fifth Centuries AD” in a new anthology on Alexandria. - Spending eight very productive and inspiring months in Cambridge. 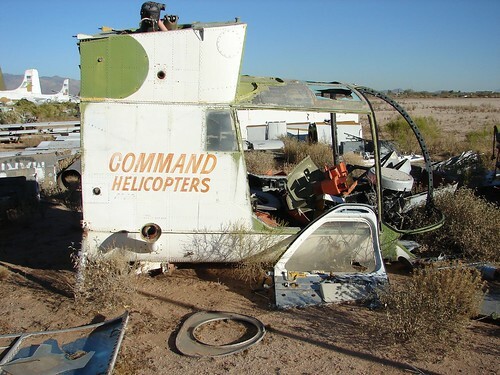 Command Helicopters. 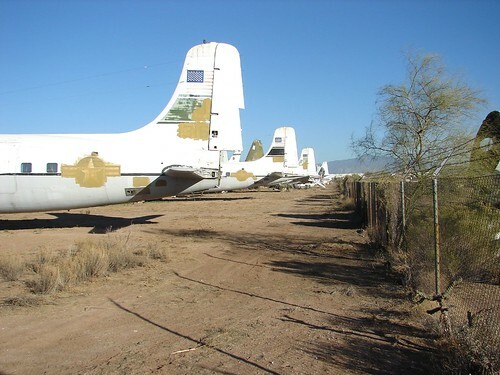 Davis-Monthan AFB, Tucson, Arizona. Photo: TMK, December 2005. Tails. Davis-Monthan AFB, Tucson. Photo: TMK, December 2005. Hypocaust in the late 4th-early 5th century Western Bathhouse at Scythopolis (Baysan / Beit She’an), Israel. Photo: TMK, June 2009. Here’s a pretty cool French blog on Near Eastern bathing culture from antiquity to today: Balneorient, run by a research project with the same title. Its latest post reports on the discovery of a 5th century AD bathhouse at Tell al-Kasra, 45 km north-west of Deir ez-Zor. See also this short notice from SANA (HT: Research News in Late Antiquity).